The TVB anniversary drama Captain of Destiny <張保仔> ended on Sunday with a blast, reaching a peak of 31 rating points during the last few seconds of the final episode. The historical sci-fi drama, which stars Ruco Chan (陳展鵬), Tony Hung (洪永城), and Grace Chan (陳凱琳), is one of TVB’s first dramas to use a heavy amount of CGI. Although the script is panned by netizens, Captain of Destiny performed decently in viewership ratings, bringing in an average of 25 rating points per episode. The last episode of Captain of Destiny averaged 29 points and peaked at 31 points, the highest rating in the entire series. This puts Captain of Destiny’s finale as the third most-watched final episode of the year thus far, behind The Empress of China <武則天> and Ghost of Relativity <鬼同你OT>. The Empress of China’s final episode averaged 33 and peaked at 37, while Ghost of Relativity’s final episode averaged 30 and peaked at 34. 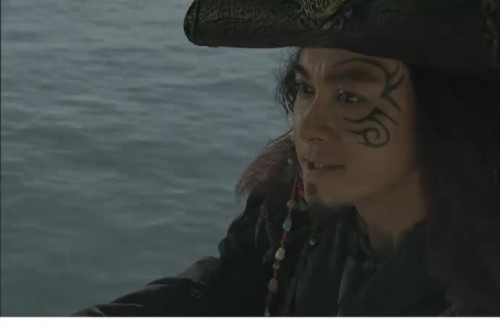 Over 2 million viewers tuned in to watch Captain of Destiny’s final moment, which was a scene involving surprise guest star Raymond Wong (黃浩然), portraying a Jack Sparrow-esque pirate, landing in modern-day Hong Kong with Cheung Po Tsai’s pirate crew. Raymond’s surprise appearance, lasting only a few seconds, pushed the episode’s viewership rating to 31 points. Raymond was originally supposed to play the drama’s titular character, the pirate Cheung Po Tsai. However, the actor had to step down one week into filming due to health concerns, and Tony Hung was called in last-minute to replace him. Although unable to partake in the series, Raymond said he is happy to see Captain of Destiny win My Favorite Drama at the StarHub TVB Awards, and also congratulated Ruco Chan for winning TV King with his performance in the drama. Many viewers and netizens shared their theories on the significance of Raymond’s appearance in Captain of Destiny, sparking hot discussion online. Netizens noticed that Raymond’s face was tattooed with a curse, similar to the curse that Tony’s Cheung Po Tsai was put on during the series. Since Cheung Po Tsai in the current timeline has traveled to the future, netizens argued that Raymond may be playing a Cheung Po Tsai from a parallel universe, thus leaving room for a sequel. Raymond Wong wasn’t the only surprise. The last episode of Captain of Destiny did drop a few more unexpected easter eggs. As Captain of Destiny shares the same cast with 2013’s Slow Boat Home <情越海岸線>, many characters in Captain of Destiny “reincarnated” as Slow Boat Home characters in the last episode. Evergreen Mak (麥長青) also made a brief cameo appearance, playing Raymond Wong’s role in Slow Boat Home. Now we’re talking!! Raymond Wong definitely carry the role of a “pirate” way better then Tony Hung, needless to say Raymond’s acting is far superior compared to Tony Hung. Should there be a sequel, Raymond shouls definitely take part as the lead character. @ricky721 one can only wish that is the case. He would have been so much better as CPT too bad he got sick but then glad he got the break that he needed to recover. @happybi , Yup, it was an unfortunte… and can’t agree with you more. With the current cast, the rating is only in the 20’s… Raymond’s few seconds appearance shot the ratings to 31!! That’s definitely a statement!! @ricky721 yes one of the viewers of the 31point ratings is me,haha, on the moment that raymond wong appears on the last minute of the drama i switch the tv on,because i know i know he will show of as a pirate,lol. @kolo it was really mean of TVB to bring in Raymond in the last few seconds…tony was forced to replace R at the last minute…but grace was given lead from start…which is the BIGGEST mistake…if I’m the only one who feels grace has been screaming from start, I am biased…but that Miss HK has been screaming like a mad one in almost every episode. TVB is blind to throw her a lead when she can hardly act. @kolo Actually I find that quite amusing; you mean, you already know way before that Raymond is going to come and switched on the TV exactly at that moment??? Even if u have that ‘psychic ability, hard to imagine many other thousands did exactly the same. Can somebody maybe try explain how the ratings are captured? @elayne I think the rating boost at the end all due to Ruco. Everyone was anticipating how the ending is going to turn out. Did Ruco die at the scene where he and Ha Sim was entrapped? Will Mui end up with CPT? What will happen to Bowie? We were anticipating for a good ending for 11th Prince. I don’t believe that Raymond’s appearance in that 2 seconds can boost up the rating. @etnngo Exactly my point; I think it’s really unfair of people (including one RTHK2 DJ I heard over her radio programme) to remark that the 31 point ratings is due to Raymond and Raymond alone!! It’s like, why can’t people give due credit where it’s due, instead of sticking to a mindset that only ”old/veteran” artistes can boost the ratings? @elayne i was just joking around dont trust me. @ricky721 He would be a riot in the sequel in modern time as a lost pirate! TVB should really consider it. And then towards the end of CPT, you had Evergreen mak clothe’s that looks similar to Raymond’s character in slow boat home. This was definitely the highlight. What parrarel universe? Just a gimmicky guest starring which further shows maybe just maybe Raymond Wong would have done a better job. Still a rubbish series if not for Ruco. @funnlim It’s an intentional spite by TVB on Tony Hung for failing in that role. Why else would TVB bring Raymond in for the finale if not to shore up the ratings to show Tony how much he dragged the series down. Absolutely agree that Ruco saved the series single handedly. Can’t exactly blame him though. he was thrown under the bus with this. Gave him a week to prepare which is obviously not enough time. All I can say is that it was a terrible choice to cast Grace as main lead. I assume the drama even the last few episodes were done filmed way before we all could judge the acting skills by Tony or grace. So it wasn’t intentional. @funnlim rubbish but entertaining,like stephen chows movie’s unrealistic plot and ott acting at least im entertained. on the other hand a oscar winning movie may have a perfect storyline and acting but mostly also boring to watch. @kolo stephen cho is a fantastic actor who is now making quality movies. Some were ott but alqys within reason. His sort of acting is distinctive and many may try to mimic but there is ever only one stephen chow. His recent movies are thoughtful and his series with tvb were all classic and still entertaining today. @funnlim yes stepehn chow was a fantastic comedy actor but he has retired too soon,since he only direct and produce films and not acting in it anymore,it hasnt been as good as before.the last movie i really have enjoyed was kung fu hustle,(already a decade ago)together with shaolin soccer his best work so far. without him in his own movie, it will never be the same. Mike Tyson, is that you? while i agree that raymond would have played a better cheung bo tsai, i don’t think tony did terribly and dragged down the series. if anything, it was grace’s annoying character and acting that was bad. Viewers criticize Tony Hung for poor acting but forgets that he originally was never suppose to play the role. While I was one that dropped the series because both he and Grace were not good actors, i feel bad for him to get all the bashing when it was TVB’s fault to give such an important role to someone who is not exactly leading man material yet. Tony Hung doesn’t match playing male lead.. I wish there would be Ruco and Raymond wong togeher!! @sojin000 Me too. I actually like Ruco and Raymond acting together.. Should get a bromance story going for them like those KDrama. But how accurate is this news wor. I mean, as if people standby their TV, waiting for the last 2 secs before the ending songs to switched on their TV or changed channel??? I mean, it is too far fetched for me to believe it loh. Most prob people just watched the last part to see the ending, or switched to that channel, waiting for the next programme to be on. But anyway, I really loved the surprise cameo of Raymond Wong, and also Ruco who dressed as CPT!!! !